The bountiful Friday market in New Denver features locally grown produce, flowers, plants, fresh baking and deliciously prepared foods. Artisans from this region are known for the quality of their beautiful handmade arts & crafts. All Welcome! Great food and more every Saturday from June to August in the big park in the centre of the Village. Interested in being a Vendor? Farmers, Artisans, Crafters, Imports–$10-$12 vendor fee. Contact Christina for more information. The Valley of the Ghosts Music Fest tickets / wrist bands are here!!! Credit Card, EMT or KSCU transfers. All tickets will be entered into the many AMAZING door prizes. 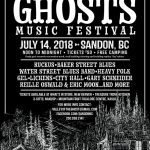 Stay tuned for more info leading up to the Ghost Fest July 14, 2018!!! All Ages, one night Unity Music Fest at the Slocan Legion featuring Gabriel Palatchi – a world class monster of a musician. Born in Buenos Aires, Argentina in 1982, Gabriel Palatchi spent his formative years studying classical piano, and being mentored by some of the great maestros of blues, tango, jazz and Latin jazz. After graduating in 2007 from Berklee international School, Argentina, he studied latin jazz in Cuba.